See how Worldscreen softens the look of an interior, and provides greater control of light. 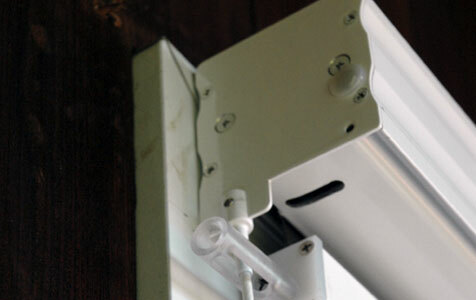 You'll notice the difference when you easily install our motorized compact solar shades. Installation of both interior and exterior options is simple. At an average of 3 pounds per foot of coverage, our shades are less labor-intensive than the competition. For typical installations, brackets are installed with the supplied stainless steel screws, the MicroCassette simply snaps into position. When everything’s in place, our patented MicroCassette technology (spanning from 3' to 40' in width with no splits in the fabric) is almost invisibledistinguishing us from our competitors and distinguishing you from your neighbors. Exterior installation of solar shades provides maximum energy control, utilizing guide rails or cable guides for stability. Our patented, discreet head box does not detract from architectural details. Sun and wind sensors in our motorized solar shades mean that your home or business will always be shielded from the elements. Interior installation ensures control of heat, glare, and UV rays while offering greater design flexibility. Worldscreen’s Microcassettes hide easily behind drapery or curtains or can become a part of your room's decor. Click here to view the CAD drawings, specifications and instructions.